I had leftover Mexican rice for lunch the other day and, even though I didn’t heat it back up, it tasted pretty good.That got me thinking of a conversation I recently had with my sister and about the list that resulted from it. There are three kinds of foods : those that just taste so much better the next day, those that work either way (today or tomorrow, hot or cold) and those that should simply never reach the leftover shelf in the fridge. Back to the Mexican rice. It’s kind of like risotto, in the sense that you begin by browning the uncooked rice in olive oil. I was inspired to recreate the flavorful rice that accompanies the “northern” New Mexican food back in Santa Fe, so I put in several familiar ingredients such as onions and hot chili powder. Since we don’t have freshly roasted hatch green chili in Paris, I used some fiery red peppers from the local farmers’ market. Though I didn’t do it this time, I think fresh corn (which is in season right now) or red beans (for example) would be welcome additions. This recipe makes enough for four – or for two with leftovers! 1. 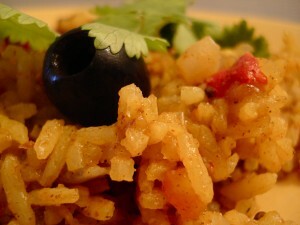 In a cast iron skillet, sauté the rice in a bit of olive oil with the saffron and chili powder (about 5 minutes). 2. When the rice begins turning translucent, add the onions, garlic, peppers or green chili and brown (about 5 more minutes). 3. Cover with water and add the bay leaves, tomatoes, and some salt. Bring to a boil. 5. Reduce heat, cover and let simmer until the rice is completely cooked (about 20 minutes). Keep adding water in small amounts as needed (avoid letting the water run out and the rice burning on the bottom). Stir occasionally. This entry was posted in Recipes (All), Recipes (Gluten-free), Recipes (Vegan) and tagged chili, santa fe, sides, spices. Bookmark the permalink.